Welcome to Texas, the wild wild western half of Texas, where the tumble weeds blow and there ain't much snow. 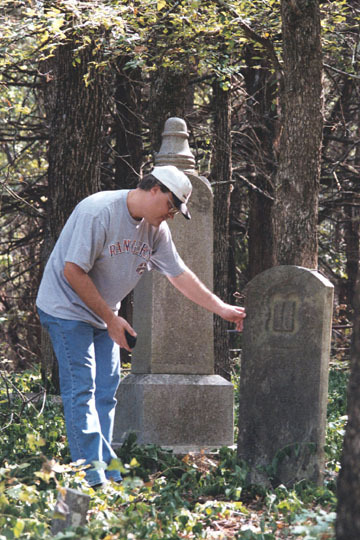 Just so you'll know that I actually do get out to a cemetery once in a while, here's a shot of me recording a tombstone at the Hendricks Cemetery in Collin County, Texas. How did I get started in this? Way back in nineteen and eighty-nine, I began to question my family history. After getting hitched, and having our first child fifteen months later, I began to research our family tree. I actually went to the library wanting to "lookup" my family tree. Boy was I a green horn. But, with the help of friendly genealogists at the local library's family section, I began to expand on what little I knew about our family. After about six years of collecting data, and a little research, I put together a self published book called "My Family - A book for Sarah and Ryan." I sold all of thirty copies, but I wasn't really interested in that anyway. It had been fun to hunt for the missing facts and ponder clues about the families history. In early 1998, I began to put my book on-line, and from there met lots of long lost relatives. Well, they weren't really lost, I just didn't know who they were. Anyway, they started coming out of the woodwork. And the on-line edition of the book grew and grew as people sent me their information. I began to notice in my own research on-line, that their wasn't hardly any cemetery listings on-line. So I went down to the big cemetery in town, where my relatives were buried, and I started writing down tombstones, row per row, section per section. Then I put what I had up on the internet and called it "West Texas Cemeteries." I then started adding to that, listing every cemetery name I could find in Lubbock County. From there I added the surrounding eight counties and did the same. As people found out about my site, they too submitted listings in other counties, and it just kept growing. Eventually, I met Gloria Briley Mayfield, who was at the time the Texas Tombstone Project Manager, and together we decided that we could do more by "showing what a cemetery is like" by the use of photographs. I believe we were the first to attempt this, back when the other sites were showing only text tables of inscriptions. We instead, are attempting to capture the cemeteries history, inhabitants, and character. Gloria and I hope that you will contribute to the site your information, as well as use it to further your own research.